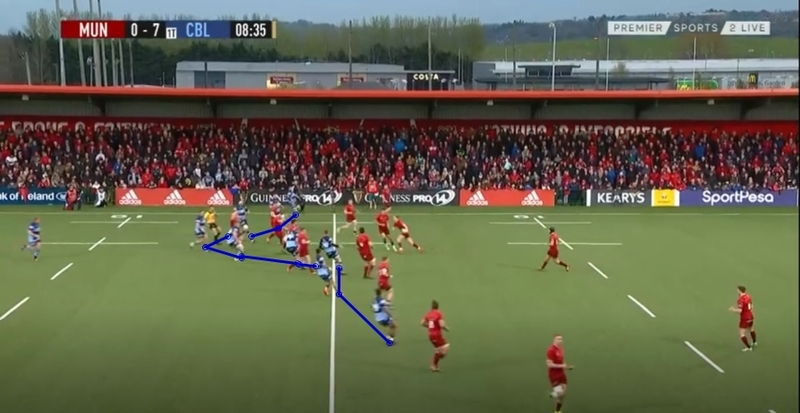 Perhaps the obvious area to look at when analysing Cardiff Blues’ Friday night defeat away to Munster is the attack, which failed to secure a try bonus point despite putting three tries on the board inside 50 minutes. We made 437 metres at just over 3.7m per carry, beating 23 defenders and making 11 line breaks altogether, but could not convert the pressure of 61% possession and 60% territory in the second half into more than one opportune score from Rey Lee-Lo created by Tomos Williams. There is also the physical aspect, how Munster overpowered us up front, particularly in the last quarter of the match and ended up running away with the scoreline that probably didn’t reflect the match as a whole, no matter how deserving of the win they were. However, ahead of next week’s massive game against Connacht in an encounter that will go a long way to deciding who finishes third in the Guinness Pro14’s Conference A, both of those issues may well have fixes away from training. Should Jarrod Evans be fit after pulling out in the warm-up in Cork then he will add a huge amount to our attack through his play flat to the line and the danger he poses with ball-in-hand himself. Even if he doesn’t make it though, the squad training with Gareth Anscombe at 10 all week should make a difference to how our attack functions as well as giving him more time to prepare. Then there’s the news that Dmitri Arhip and Nick Williams are both expected to be fit after missing out on the Munster game with knocks that might not have ruled them out if there wasn’t a season defining game on the horizon. They will help return that physical edge to our set piece and defensive work in particular, as well as going up against a Connacht team that doesn’t quite have the weight that Munster possess up front. Instead I’m going to look at the kicking game we put in place at Irish Independent Park, and how we need to improve in all aspects of it ahead of a trip to the notoriously gusty Sportsground in Galway. Altogether we kicked from hand 24 times in a swirling Cork wind, with a generally middling success rate in terms of putting Munster under pressure. The two Tomos Williams kicks are both poorly executed, with one clearly too long and the other too short, while Matthew Morgan has to find touch with the clearance kick having let the ball travel right up to the try line, but it isn’t the actual kicking that concerns me too much. A mediocre kick can be turned into a great one with a good kick chase. Just ask Wales with Gareth Davies at scrum-half not renowned for his box kicking, but the men in red are so well drilled in their kick chase they can put teams under pressure in an instant. On this occasion the kick from Tomos Williams is actually spot on, and Owen Lane chases well to bring Darren Sweetnam down before the Munster winger can get the ball away. However, Cardiff Blues fail to back up this initial chase, with only Seb Davies coming close to the subsequent tackle area. There is a great chance to put Munster under some real pressure at the breakdown, with only fly-half Tyler Bleyendaal over the ball. If, from the kick, we can organise three forwards to chase in the second wave, then they stand a great chance of arriving ahead of the opposition support. We see in the final image the players in red having to get around the ruck before they can bind, with Seb Davies beating them there. 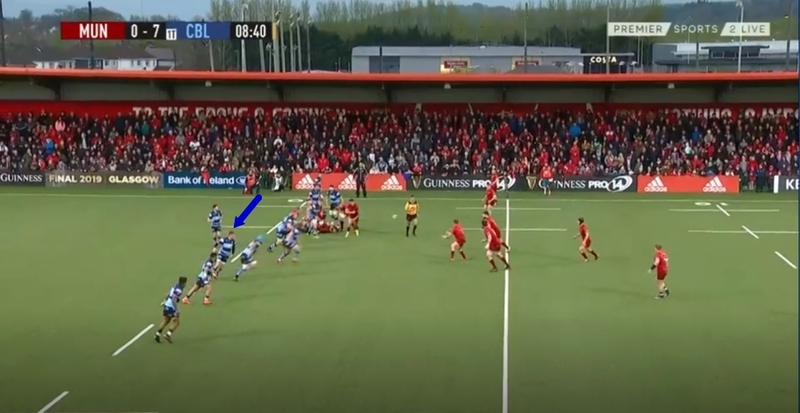 Give him some support and they can remove Bleyendaal before the support arrives, creating a counter-ruck situation to at least disrupt the recovery from Munster, and at best secure a turnover. The quality of the kick chase is something that can put pressure on the opposition, but at the very minimum it should stop the opposition being able to put pressure back on ourselves. Unfortunately, on this occasion we turn up with a dogleg line, held back where forwards are coming up from the previous breakdown, and Mike Haley can carry up towards the 10 metre line inside the Cardiff Blues half. This in itself isn’t a huge gain, but those few yards mean Haley finishes his carry behind the outside backs who have come up in the kick chase. 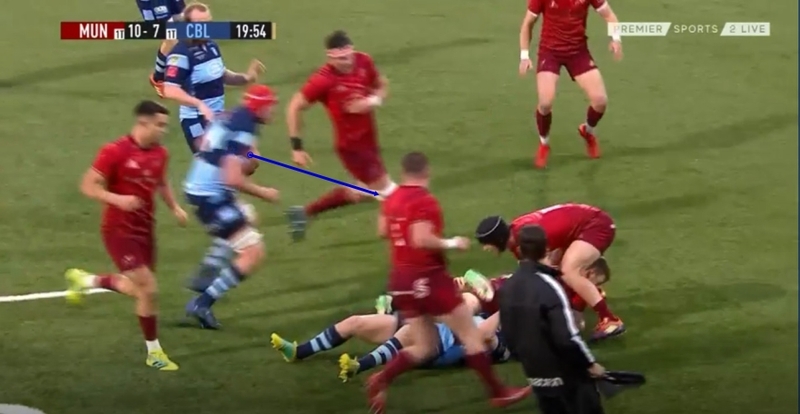 As a result the next phase sees our defence not set to get off the defensive line, with Gareth Anscombe highlighted as still turning to face up when the ball is almost in Bleyendaal’s hands. A decent chase stops Munster early, forces them to travel further back to get set for the attack, and allows Cardiff Blues to bring the line speed and intensity that caused the Irish side a fair amount of trouble during attacking phase play. Finally then, Munster are able to properly turn the pressure back on Cardiff Blues, making excellent ground on the kick return and forcing back into a defensive set starting on the edge of our own 22. The issue is an understaffed kick chase, once again centred around the forwards playing catch up after being involved with the set piece in the lead up to the exit. 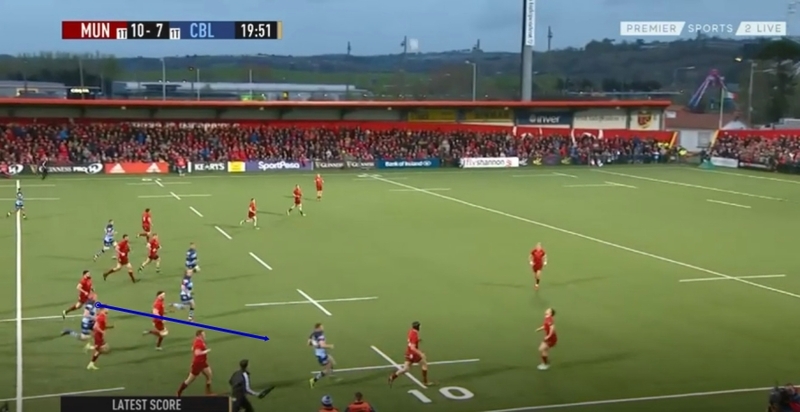 As a result the outside backs are turning their shoulders in to cover that space on the left hand side of the chase, so that when Munster can change the point of the counter attack, there is a lot of space available on the right hand side of the kick chase to exploit. All in all a few areas to concentrate on surrounding our kicking game, and particularly our exits, when it comes to how we setup the box kicks without tying too many forwards into the breakdown or set piece beforehand. From there it’s about discipline and attitude, the leaders setting the line and the speed, the rest of the team working hard to set up the blue wall and put pressure on Connacht. Cardiff Blues undoubtedly have the attacking firepower to put any side to the sword, and are increasingly showing up a defensive organisation and line speed that can trouble top quality opposition, but it is about knitting them together that will see us go to the next level.